Ed and Vicky Welch have been raising Dairy goats since 1971. They started raising hay for them in l975 and began growing spanish roja garlic in l977. They have always used organic mehtods and fell in love with the Methow Valley in l973 when they moved here that year, establishing what is now Sunny Pine Farm. Ed and Vicky started growing organic vegetables for market in1988. They enrolled Sunny Pine in the Washington State Dept. of Agriculture's Organic Certification Program that same year, and have remained certified organic growers since then. They have maintained a coveted low number in the organic certification program, #14 perhaps due to their unwavering comitment to caring for the land and providing the highest quality produce and products to their friends, neighbors and customers. We believe that a biologically active soil is the key to healthy soil, plants, animals and humans. To acheive this we incorporate lots of organic material into the soil in the form of green manures, composted or aged animal maures. In addition we do biannual soil testing to determine available levels of minerals and add those deemed lacking in the form of rock powders and granuals such as high calcium limestone,gypsum, rockphosphate, greensand, potasium sulfate, certain types of coal, rock powders, kelp and souble sea weed as well as liquid fish. In the proper balance these soil amendments can create an environment that favors beneficial microbial activity and proliferation inthe soil. When we are successful in this ballancing, we have bountiful, flavorful, and beautifull vegetables for everyone to enjoy. We monitor our crops on both a daily and weekly basis. We have found that by maintaining high brix (measurement of dissolved solids, includes sugars) we are able to minimize insect and disease problems. The key to high brix levels is balanced soil nutrient levels and abundant levels of soil micobes. Because microbes are so important we send soil samples to a special lab in Oregon so they can tell us levels and types of microbes present. It is interesting to note that specific plants do better when specific microbes are present. They give us recommendations on green manure crops and soil amendments to favor the crops we are growing. The other thing we do to enhance the population fo desired microbes is to dip the roots of all our transplants in solutions of desireable micobes that we purchase from suppliers. Last year we purchased our own microbe brewer affording us the ability to innoculate the soil several times a year with beneficial soil microbes. It is the web of microbes... enzymes.... and hormones in the soil that can actually provide the plants with super nutrition which in turn conveys superior taste and nutrition to the consumer. Thus... at Sunny Pine Farm we take care of our soil microbes and their environment. Sometimes our efforts fall short and we notice that the Brix levels start to drop, Usually this can be ovecome by applying minute amounts of plant nutrients directly to the leaf's surfaces. This is called folliar feeding. We measure brix levels regularly with a refractometer and then decide whether or not to spray with foliar nutrients such as sea weed, fish, and/or amino acid chelates. 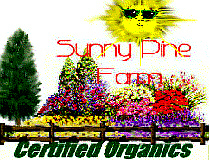 At Sunny Pine Farm we are always striving to acheive the highest quality. We welcome visitors and would be happy to show you our modest... but humble operation. Beginning this summer we will be offering our vegetables, herbal products, organic vegetable oils, and essential oils to you with home delivery service once a week. If you would like to take advantage of this service please respond via e-mail or write. If there is something that you would especially like us to grow let us know now.